The House of Representatives has 465 members, elected for a four-year term. Of these, 176 members are elected from 11 multi-member constituencies by a party-list system of proportional representation, and 289 are elected from single-member constituencies. 233 seats are required for a majority. 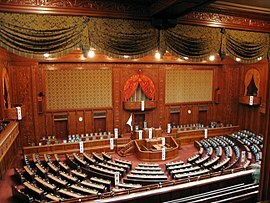 The House of Representatives is the more powerful of the two houses, able to override vetoes on bills imposed by the House of Councillors with a two-thirds majority. It can be dissolved by the Prime Minister at will, the most recent was by Shinzō Abe as on September 28, 2017. While the legislative term is nominally 4 years, early elections for the lower house are very common, and the median lifespan of postwar legislatures has in practice been around 3 years. ^ The Cambridge History of Japan, Vol.6, chapters 2 (Taichirō Mitani: The establishment of party cabinets, 1889–1932) and 3 (Gordon M. Berger: Politics and mobilization in Japan, 1931–1945).